Eco friendly solutions for St. Maarten/St. Martin with GreenSXM. It may sound rude but – Stop Sucking with GreenSXM. We all need to start somewhere and GreenSXM offers alternative concepts that we can do to minimize waste and help our environment. There is a big trend world wide to Go Green, making our planet a healthier place to be is on the minds of many. On St. Maarten / St. Martin we must do something to help our enviroment. Every effort, no matter how small it is, will make a difference to the dump and therefor to each and every one of us who love this island. 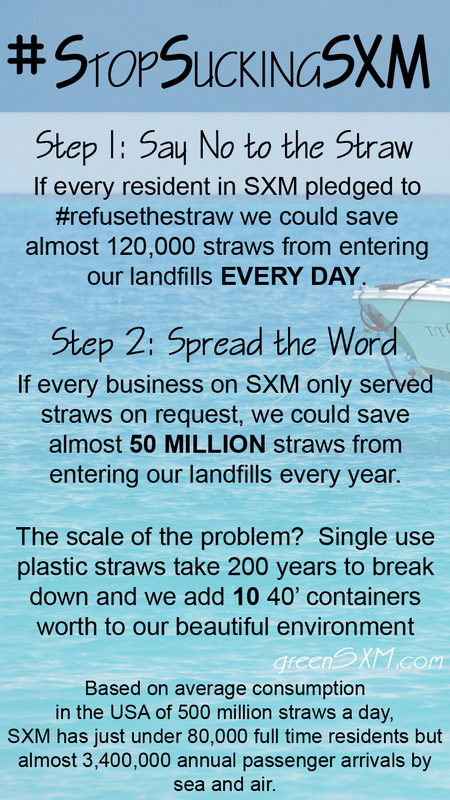 GreenSXM is all about us; can we help our gorgeous little corner on this planet. Can we start doing away with plastic? Let us start by Saying No to the Plastic Straw.